I think the most wonderful thing about voluntary simplicity is that it means different things to different people. There is no one way to do simple living right. Everyone has a different concept of how they want to live, what is most important to them, and what they need to make them happy. Trying to live someone else’s idea of simplicity will never work. For us, all of our most important things are home and family oriented. We have a deep respect for all living things and a strong need to live close to nature. We value privacy and solitude and probably need more than the average “personal space.” We find working hard and tackling seemingly impossible projects to be both satisfying and fulfilling. Most of all, we genuinely enjoy each other’s company and working and spending time together. This is our version of voluntary simplicity and simple living, and it is a lifestyle we love because it matches who WE are. Do you know who YOU are… what’s important to you and what you want and need in your life? If you have a genuine interest in pursuing simple living, do some soul searching as you answer these questions. Bring into your life as many things as you can that have meaning to you and give you a sense of peace and fulfillment… purge some of what makes you feel stressed and unhappy. Make only small changes and only a few at a time. Be honest and flexible in your assessments and don’t be afraid to admit to yourself when something you thought would work doesn’t. As you discover what is really important to you and the way you want to live, use what you’ve learned to gradually restructure your life. 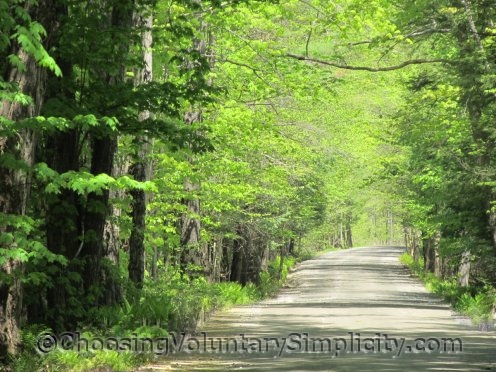 This will be YOUR version of voluntary simplicity… and YOUR way to do simple living right. Thank you! Your articles have been very helpful to me! I have 6 kids, and have had a hard time letting go of certain things. I felt like I needed to purge just to purge, thinking that having less things would make me happier. I didn’t know where to start, and was looking for answers. Everything I read didn’t satisfy me, and now that I’ve read your words of wisdom, I have more direction. Thank you, again. My husband and I left the suburbs of Chicago for a quiet, simple life in the country, and wouldn’t go back for all the money in the world. We cut our household income in half, but increased our happiness ten-fold. I wish more people could learn that more stuff is not better, it’s just more. Thanks so much for your wonderful blog! Sounds like your idea of simplicity matches our’s exactly! We moved to a simpler life a few years ago and have never looked back! I could have written that second paragraph myself as it describes perfectly my hubby and I! Thanks for the reminder to focus on what living simply means to ‘us’ and to work towards that goal step by step and day by day.